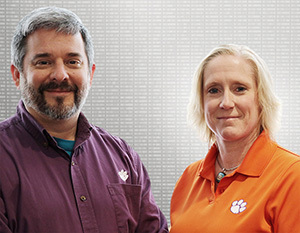 Scientists at Clemson University are working on system that will help improve and simplify large-scale data analysis around the world. The NSF-funded project, called Scientific Data Analysis at Scale (SciDAS), aims to "help current researchers and future innovators discover data, move it smoothly across advanced networks, and improve flexibility and accessibility to national and global resources," according to a news release. "Many fields are awash with huge datasets," said principle investigator Alex Feltus, associate professor of genetics and biochemistry in Clemson University's College of Science. "This is certainly true of biology and hydrology, but it also includes researchers who are studying satellite imagery, remote sensors and education analytics, to name a few. Today's scientists are now required to understand both the underlying science and the cyberinfrastructure ecosystem to design and execute mind-bogglingly complex computations. SciDAS will combine new software with existing software to construct a system that will be efficient, practical and user-friendly." SciDAS will bring together multiple national cyberinfrastructure resources, including NSF Clouds, the Open Science Grid, the Extreme Science and Engineering Discovery Environment, petascale supercomputers such as COMET, Clemson's Palmetto Cluster and other nationwide university resources. In addition, Internet2's cyberteam will help optimize end-to-end data transfer rates. By exploiting the distributed and scalable nature of these resources — in terms of both data sharing and compute infrastructure — the researchers expect to boost data analysis performance and scientific productivity. The result: "SciDAS will enable a broad range of scientists to not only get information faster but also to use much larger datasets and tease out information that they might not even know exists," according to the news announcement. "A key aspect of the SciDAS team is that we'll be processing scientific data at the same time that we're gluing together all the parts needed for a national cyberinfrastructure ecosystem," noted Feltus. "We're trying to avoid the problem of 'if you build it they will come' and instead enlist the input of a variety of scientists to join us on the ground floor and help us build it. Thus, our software will be refined by using real data by real users with real habits." Feltus and co-principle investigator Melissa Smith, associate professor in the Holcombe Department of Electrical and Computer Engineering in Clemson's College of Engineering, Computing and Applied Sciences, discuss their work in the video below.